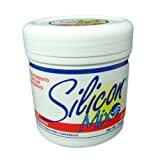 Silicon Mix Intensive Hair Treatment Hair treatment to restore the health, shine and the softness of dry, damaged and weak hair. DIRECTIONS : Wash hair and towel dry. Apply with massages. Leave on from 2 to 3 minutes depending on the condition of the hair. Rinse. INGREDIENTS : Water, Mineral Oil, Cetyl Alcohol, Stearyl Alcohol, Glycerine, Citric Acid, Cetrimonium Chloride, Dimethycone Copolyol, Cyclomethicone, Keratin, Ceramide, Diazolidinyl Urea (and) Iodopropynyl Butylcarbamate, Fragrance. 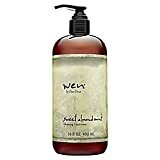 Sweet Almond Mint is the perfect balance of nourishing herbs and natural ingredients designed to hydrate and replenish hair that has been damaged due to shampoo and other harsh elements. May be used as often as necessary, it thoroughly cleanses hair and scalp without stripping them of their natural oils, providing it with added moisture, strength and sheen.